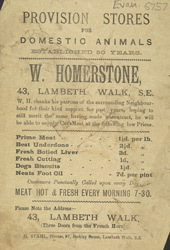 Butchers in the 19th century offered a wide variety of meats to their customers - from beef and lamb, to the more expensive pheasant, pigeon and veal. Meat was prepared for breakfast in large and wealthy Victorian homes and if guests were present there was always a choice of at least three different dishes, from cold tongue and ham to hot game pie or even steak. Roast beef was generally prepared for dinner, and very wealthy families ate woodcock. These birds were so expensive that just one dinner cost the same amount as the scullery maid’s wages for a year. Not every family could afford meat every day, of course, and working-class families usually only had meat once or twice a week.